I love all things cherry flavored: lollipops, sour candies, popsicles, and of course, soda! From what I gather from my friends and even random people I meet, artificial cherry flavor is not something people look upon with glee. I mean, there is a huge difference between artificial cherry and real cherries, but still, all cherry flavored things are delicious in my books! I always get excited when cherry season rolls around. I’m partial to Bing cherries, not only because they’re one of the most common cherries in the Pacific Northwest, but also because they are the cherries we grew up picking. My parents would pack us (and a tent) in our minivan and we’d head to the interior of BC where the fruit orchards are. We’d pick a ton of fruit, camp, and live a nomadic fruit picker lifestyle, for a couple of days at least. It was the best! I haven’t picked fruit in a really long time, unless picking out fruit at the stands at the farmers markets counts? I’m hoping Mike and I will have a chance this year because if we do, I’m going to be picking pounds and pounds cherries. 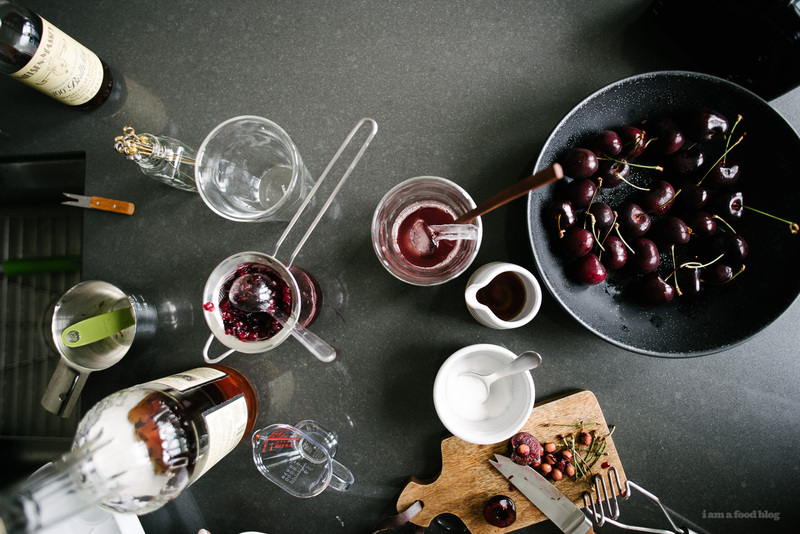 Mike wants to try making boozy homemade maraschino cherries and I want to make clafoutis and cherry sodas! 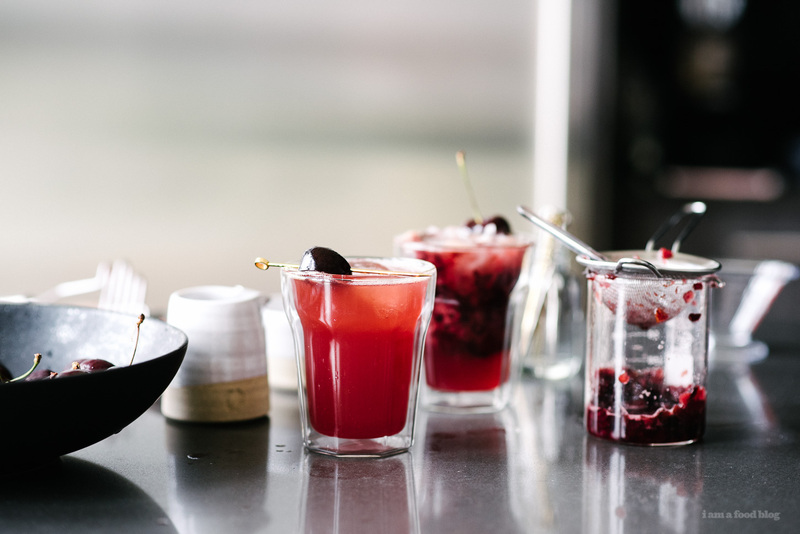 These simple cherry sodas are just the ticket for a hot day. I added a generous amount of bourbon into Mike’s glass for a cherry bourbon smash and kept mine simple and extra cherry-ful. Cheers! PS – It’s summer so it’s time for ALL the drinks! 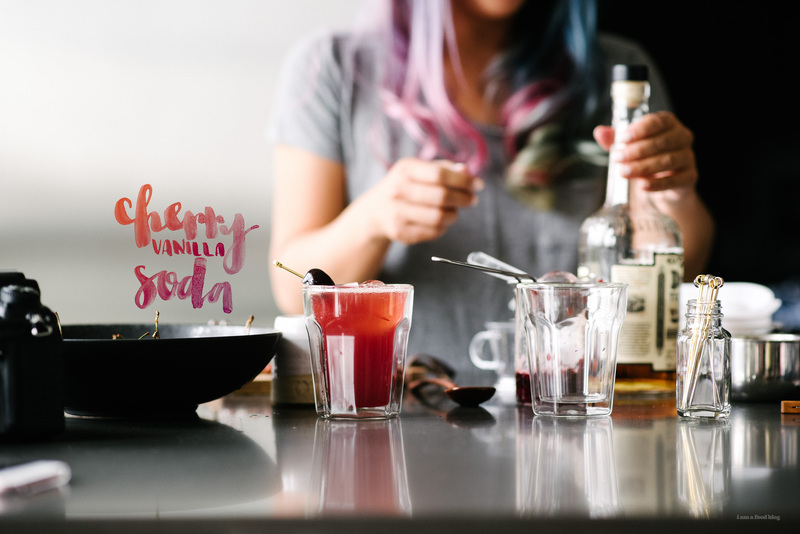 Sherrie from With Food + Love is hosting a huge drinks party. 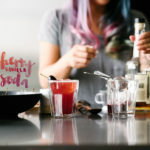 Check out #drinkthesummer right here if you’re even the slightest bit thirsty :) I’ve got my eyes on Ginger-Berry Splashes, Vanilla Plum Shrubs, and Watermelon Mint Agua Fresca! Happy Summer! In a small bowl or liquid measuring cup, pour the sugar over the cherries. 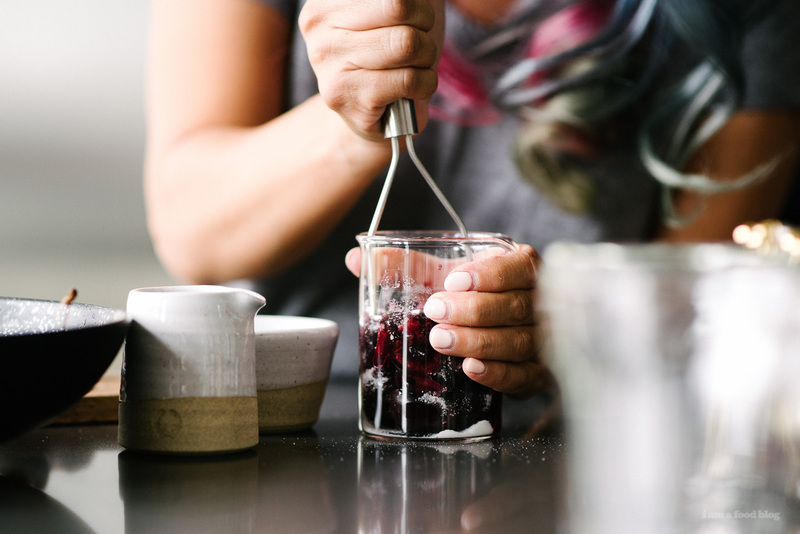 Let macerate for a couple of minutes, then use a fork or small potato masher to crush up the cherries as smooth as possible, making sure the sugar is dissolved. If you don’t like bits in your drink, strain the cherries, pushing down on the fruit to extract as much juice as possible. 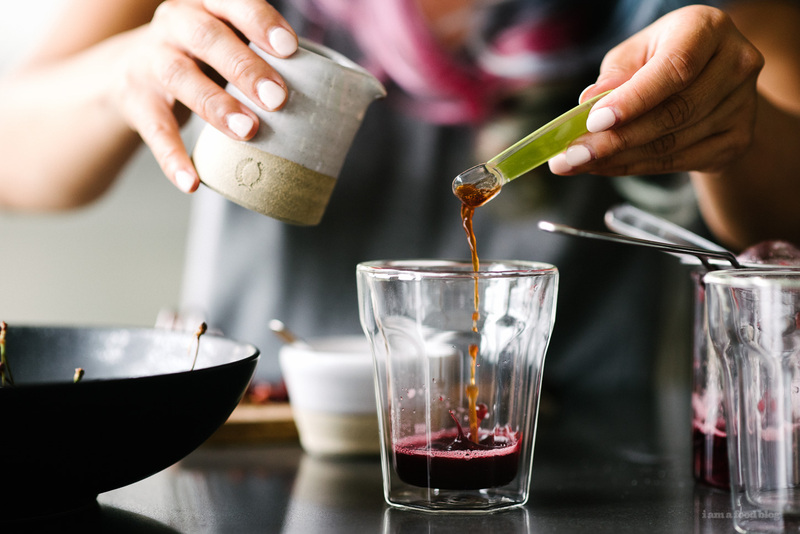 Divide the juice evenly between two glasses and add 1/2 teaspoon of vanilla (use the good stuff!) to each. Top off the glasses with soda water and ice, stir and enjoy! So sweet and amazingly refreshing! This is one summer drink that I could really get obsessed with!!! Cherry soda with bourbon? Yes please. So jealous of your cherry picking adventures! Seriously, like a dream of mine. You haven’t really lived until you’ve sipped fresh cherry juice :) Fresh, homemade soda is the best. You’d better hurry if you want cherries this year. The season’s almost over! Definitely going to have to try this out! It’s a soda I wouldn’t mind giving to the kiddos. I can see all kinds of possibilities as side from bourbon too. Vodka, gun, champagne. Autocorrect strikes again! That would be gin, not gun! That sounds amazing. Is there any chance you would have a recipe for an old-fashioned ice cream soda? YES! We’re all over making this. Thanks! This reminds me of something from my university days – I was living in London, England, and I often visited my elder cousin. We were both part of the same boxing club, and had been for a long time. We even kept similar training and competition schedules. But with one major difference – he had to cut weight to compete, while I was able to compete at my natural weight. And whenever he was in the process of a cut (which was 3/4 of the year! ), he had to endure a terribly restrictive and bland diet – the only thing he could look forward to? A small can of Cherry Coke at the end of the week. Cherry Coke isn’t that easily available near his home anymore. I think next time I visit I’m going to make this, switch the soda water for a little cola, and see if it stirs up any old memories in him! REAL INTO THIS Steph. Thanks for hanging with us for #DRINKTHESUMMER 2016!!! !